Say “Belize” and many people think of this English-speaking country’s two famous islands—Caye Caulker and Ambergris Caye. But for diverse, off-the-beaten-track family adventure, few spots can top the combination of culture, nature, history, and fun centered around Punta Gorda (known as PG) on the mainland in Belize’s Toledo District. With a small population of about 5,500, PG is a laid-back Caribbean fishing town, but its secret is in its diverse surroundings. In PG, the question is not, “What do you want to see?” It is, “What do you want to experience?” Here are three great ways PG answers that question. 1. Untamed Nature: Jungle, river, and sea all meet in southern Belize, and in PG you are perfectly poised to explore them all. Spot crocodiles, turtles, marsh birds, and everyone’s favourite noisy neighbors, howler monkeys, on a Monkey River boat tour, and watch for the endangered manatee—the elusive sea cow—which occasionally makes a cameo appearance near the river’s mouth. For ocean excursions, a 2.5-hr boat trip takes you to Sapodilla Cayes, in the Mesoamerican Barrier Reef system, which attracts an incredible variety of exotic tropical sea creatures, making scuba diving, snorkeling, swimming, and sea kayaking simply spectacular. Or, closer to shore, try snorkeling or diving the coral reefs in the Snake Cayes, rich with marine life. Inland, get ready for jungle adventure at Mayflower Bocawina Park, nature’s 28.5-sq. km/11-sq. mi playground. Hike along rustic trails, swim in waterfall-fed pools, soar along the longest zip-line in Belize, explore three Mayan archaeological sites under excavation, or challenge yourself to waterfall rappelling in this uncrowded hidden gem. If you love caving, add a four-hour tour of Hokeb Ha Cave at Blue Creek to your list, or try Laguna Cave and Tiger Cave. And despite a 1.5- to 2-hour trek to get there, diehard cavers won’t want to miss the soaring stalagmites, stalactites, flowstones, and other spectacular formations of Yok’ Balum, a fascinating cave more often visited by scientists than by tourists. 2. Ancient Civilizations: Southern Belize is the site of some of the earliest Mayan settlements (Preclassical: 2000 B.C. to 250 A.D.). Two of the most popular archaeological sites are Lubaantun (700-900 A.D.), once the largest Mayan ceremonial center in southern Belize, and Nim Li Punit (250-1000 A.D.) featuring pyramids and impressive stone stelae (pillars), some with intricate carvings. 3. Garifuna and Maya Cultures: Immersion in different lifestyles and cultures may be the greatest benefit of off-the-beaten-path travel for families. Southern Belize is home to the Garifuna culture, a fusion of African and Carib Indian cultures with a lilting language declared a UNESCO Masterpiece of Oral and Intangible Heritage of Humanity in 2001. 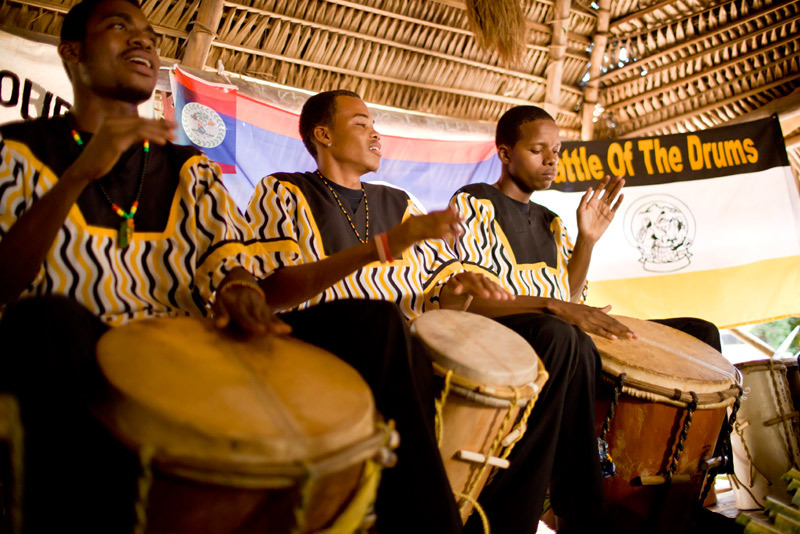 In PG, you can sample unique local cuisine, like cassava pudding and a plantain dish known as “hudut,” and learn about the powerful percussive Garifuna music at the Warasa Garifuna Drum School. If you’re traveling in November, don’t miss PG’s annual Battle of the Drums and Food Fete, a three-day celebration of Garifuna music, flavours, and history. This region also has a strong Maya presence, which you can discover through the Living Maya Experience tour. Kek’chi Maya families will open their homes to show you how Maya peoples lived 50 years ago and today, and they will teach you to prepare a typical meal or try your hand at crafting baskets, textiles, and hammocks in the Mayan tradition. And don’t forget the chocolate! Green & Black’s “Maya Gold” and Ixcacao Chocolate source their cacao in Toledo District, and on chocolate tours you can wander through the cacao groves, learn about chocolate making, and even make your own delicious chocolates. If you’re a true chocoholic, don’t miss May’s annual Festival of Chocolate.